African Immigrants in Italy: A shadow of ethnic cleansing? To give a dog a bad name in order to hang it has become synonymous to the plight of African immigrants in Italy. The Italian government under Prime Minister Silvio Berlusconi, and his Interior Minister, Roberto Maroni have been accused of exploiting and inciting xenophobia and racism. Africans live in a war zone without protection. Politicians have contributed in creating an atmosphere of fear, by blaming African migrants for every thing wrong with Italy- a propaganda that has rallied street vigilantes against African immigrants, and brought about racial-based violence and counter violent protests in Southern Italy. Reuters has described the events as "some of the worst racial violence in Italy since World War Two" when Italy allied with the Nazis. According to Italian immigration laws, refugees without proper resident documentation can be locked up for six months. Illegal immigration can be punished by a fine of up to €10,000 and immigrants must pay €200 for an application for a residency permit. In addition, the new law requires that teachers, officials and sanitary personnel reject illegal immigrants, and it threatens landlords with prison who provide them [African immigrants] with housing. The laws also legalize the introduction of civilian militias [vigilantes] to supplement the systematic use of soldiers to patrol city centers. Italy, according to some Analysts, is now a climate reminiscent of Mississipi Burning, a 1988 film loosely based on the real-life murders of three civil rights workers in Mississippi in 1964. Analysts have also said the Italian regulations give support to fascistic elements and it does not only undermine the basic democratic rights of refugees, but those of the entire working population. At the same time, the government’s campaign against immigrant workers is increasingly being used to provide a scapegoat for the country’s economic demise and deflect blame away from the ruling elite. Italy, along with Spain, has one of Europe’s fastest-growing immigrant populations. Citing the Catholic charity, Caritas, immigrants in Italy now account for 7.2% of the resident population in the country. The estimated 4.5 million legal immigrants are said to contribute immensely to the Italian economy. Nonetheless, some influential politicians and the national media would not condone an integrated Italy. With xenophobia, and resentment towards African immigrants propagated by the government and media, the killings have continued intermittently, and incessantly, in what many have termed a systematic, shadow ethnic cleansing of Africans from Italy. Most recently, African migrants have taken to the streets in protest of the indiscriminate killings. On Thursday, Jan. 7, a gang of white youths in a car fired air rifles at a group of African immigrants returning from work on farms, injuring two of them. 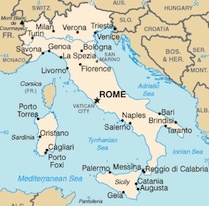 On Saturday Jan. 9, two African migrant workers were shot and two more beaten with iron bars, as racial unrest continued to grip the town of Rosarno in the south of Italy, a series of reports have claimed. The attacks set off a night of rioting by dozens of Africans, who smashed car windows with steel bars and stones and set cars and rubbish bins on fire. Even as the African demonstrators marched through Rosarno to the town hall, local news reported that a resident fired shots into the air from his balcony, allegedly to protect his wife and child, who he said had had stones thrown at them by protesters. Nonetheless, the latest riot began as a protest against the insecure conditions in which the immigrants find themselves. While the Africans rioted, interior minister, Roberto Maroni, sought to defend his hardline against the African migrants saying that the tolerance of clandestine immigration for all these years had fed the crime situation in the south. But according to observers, Mr. Maroni has not said a word about the shootings and beatings the African migrant workers have been victims of. Nor has he mentioned the squalid living conditions at the unoccupied factory on the outskirts of town that serves as sleeping quarters for these workers from all over Africa who number in their thousands in and around the town of Rosarno. Some 8,000 illegal immigrants work in the southern Calabria region where the clashes have erupted, most as day laborers picking fruit and vegetables. Many live in abandoned factories with no running water or electricity and human rights groups say they are exploited by organized crime. Opposition leader, Pierluigi Bersani and several center-left politicians accused Maroni of fuelling the tension: "Maroni is passing the buck ... we have to go to the roots of the problem: Mafia, exploitation, xenophobia and racism," Bersani said. Most, if not all, African migrant workers in the South of Italy are forced to live without sanitation, electricity, water or heating coupled with the racial and xenophobia motivated killings they face. Several thousand immigrants live in and around Rosarno while helping with the harvest of oranges and clementines. The parish priest of Rosarno, Father Carmelo Ascone, said they reminded him of the circles of hell in Dante’s Divine Comedy. These attack on African migrants and their subsequent counter-attack has resulted in a vicious cycle in the South of Italy. Furious about the violence and damage created by the rebelling African migrants, groups of locals occupied the town hall and blocked a main road, resulting in several clashes between locals and immigrant farm workers. The prime minister, Silvio Berlusconi, this year was quoted as saying that the streets of Milan reminded him ‘of an African city’ these days. The European country has taken a hard line against illegal immigration and has moved to stem a tide of immigrants who board boats in Africa to try to reach its southern shores. Some boats have been turned back on the open seas. Condemning the attacks and rallyng support for the immigrants, Pope Benedict XVI is quoted as saying: "An immigrant is a human being, different in where they came from, in their culture and tradition, but a person to respect who has rights and responsibilities." "We have to go to the heart of the problem, of the significance of the human being," the Pope said. • Will Italy legalise xenophobic and anti-African laws? • Obama: Another family portrait!